Square just detailed the PAL collector’s edition of Star Ocean: The Last Hope, releasing next Friday. Unique ‘digistack’ packaging with dual gatefold, inside a special collector’s sleeve. 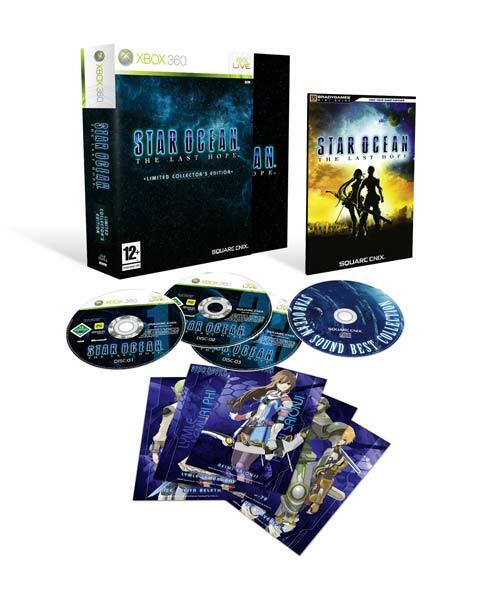 The STAR OCEAN Sound Best Collection showcases key themes from across the series specially chosen by the game creators and series fans. Collectable prints of lead characters from the game, using rare artwork not officially released in Europe and other PAL countries. 32 page game guide printed in full-colour, with extra character artwork, descriptions and walkthrough information – to help you on your journey through the universe. Expansive galactic adventuring goes across three game discs, accompanied by full-colour play manual. Hit the link for an image. London (26th May 2008) – Square Enix Ltd., the publisher of Square Enix® interactive entertainment products in Europe and other PAL territories, today announces that a Limited Collector’s Edition of STAR OCEAN®: The Last Hope™ will be released across PAL territories on 5th June, 2009, on the Xbox 360® video game and entertainment system. With this highly anticipated prequel, acclaimed development studio tri-Ace Inc. brings the STAR OCEAN series to Xbox 360 for the first time. STAR OCEAN: The Last Hope continues the series traditions of soaring space opera, blending science fiction with fantasy for a unique RPG experience. The refined gameplay features four party members and team-oriented combat, while maintaining the innovative real-time battle system that has become a trademark of the STAR OCEAN series.